I was a little skeptical before playing this game. I expected bad graphics and a simple yet boring game, but it turned out to be quite amusing but still simple. When you start the game you will have a little story about what is happening. It kind of goes like this…. The story starts out by plankton wanting to build all these robots to get the, what else…the wonderful Krabby Patty, but something goes wrong, like always. Plankton forgot to switch the switch to make the robots listen to him! 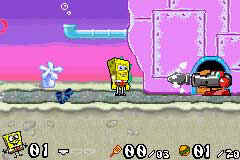 Now all the robots are all over bikini bottom and they are scaring away all Mr. Crabs customers, but Spongebob comes to the rescue and so the story begins. 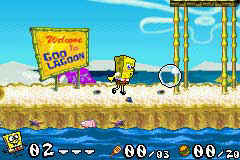 Well my first comment about this game is that if you don’t like Spongebob DON’T BUY THIS GAME! You will not get a lot of it and you will probably not find it as cute and amusing as people who like Spongebob. So you may want to just stop reading now if you don’t like Spongebob. Ok, now lets talk about the game play now . At the beginning I said I was skeptical about the graphics of the game and actually the graphics are quite nice. The backgrounds are always different each of the levels and they all look very nice. The only setback in the graphics is that the characters, like Spongebob, seem to be poorly “drawn” you could say otherwise the graphics are great! The game is fun, addicting, and will provide quite a few hours of playtime. 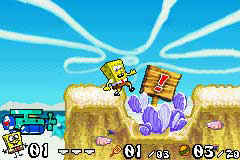 Also since the game is kind of like a arcade game you may enjoy playing it over and over again, thus, in return, giving you some replay value:) If you love Spongebob you will probably love this game, but make sure you read the con’s before buying this game. Well the biggest con is that you have to remember codes to get back to your saved games. So every time you finish a level you have to write down the code so you can get back where you started (this does, however, allow you to cheat if you know the codes:). Another thing is that your scores aren’t saved so you can’t have high scores or any of that other nice stuff:( NOTE TO GAME DEVELOPERS: Please don’t use codes to save games! 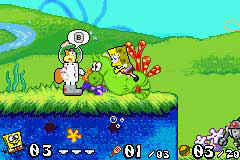 Well, in conclusion, you will probably like this game if you are a Spongebob fan, but if you aren’t, you probably won’t want to buy this game. Also, remember before you buy this that you have to write down codes on PAPER (yes, paper. That thing that no one uses anymore) to continue your game at a later time. I give this game 3 out of 5 stars.